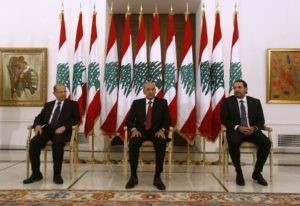 The three Lebanese leaders denounced in the strongest terms the Israeli border wall, which, they said, infringes Lebanon’s sovereignty and undermines border stability. President Michel Aoun, Prime Minister Saad al-Hariri, and Parliament Speaker Nabih Berri agreed to act to stop Israel from building the border wall and vowed to defend Lebanon’s maritime boundaries as Beirut plans to explore for offshore oil and gas. The Israeli threats are a clear violation of Security Council Resolution 1701 and a direct threat to the stability of the border region, the three leaders said in a statement following their meeting at the Presidency. Aoun, Hariri and Berri met with the UN mission in Lebanon (UNIFIL) force commander Major General Beary in late January over the issue of Israel’s wall construction. Lebanon then accused Israel of undermining peace with its construction, stressing that it “isn’t compatible with the efforts that (UNIFIL) is exerting in cooperation with the Lebanese army to preserve security and stability along the southern border”. The construction of the wall was also criticized by Hezbollah’s Secretary General Hassan Nasrallah who warned Israel against the continuing construction. Israeli Defense Minister Avigdor Lieberman last week called Lebanon’s first offshore oil and gas exploration tender “very provocative” and urged international firms not to participate. Written by: Jaber Ali on February 6, 2018. Posted by Jaber Ali on Feb 6 2018. Filed under Headlines, World News. You can follow any responses to this entry through the RSS 2.0. Both comments and pings are currently closed.